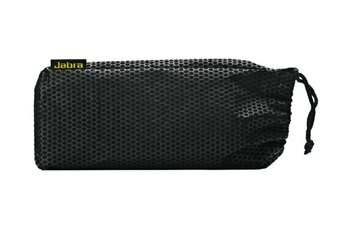 The protective carrying case keeps it safe against sand, dust, and light amounts of water. 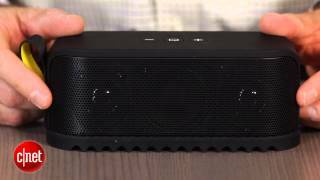 The rubber grip on the bottom prevents the speaker from slipping and sliding across the table and keeps rattling to a minimum. The Soulmate has speakerphone capabilities, and it is available in a variety of colors. The speakerphone experience could be better for both ends of the phone call. The voice-assisted setup is loud and the accompanying music is somewhat jarring. 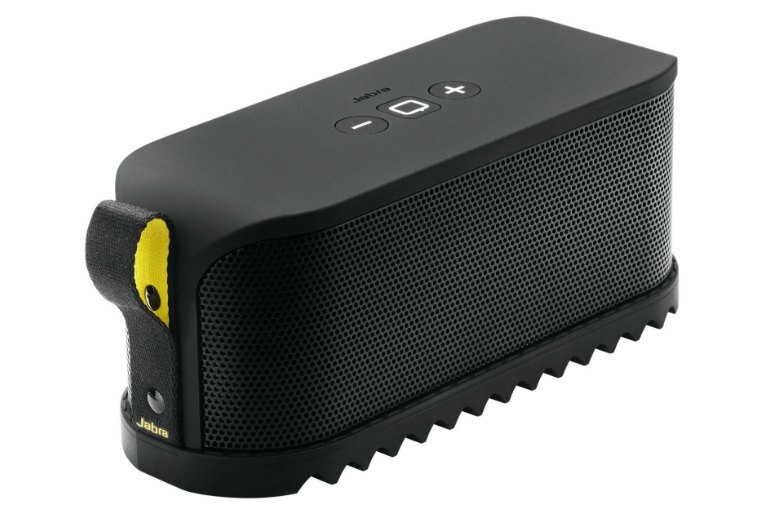 With a design that’s unlike any other Bluetooth portable speaker, the Jabra Solemate has the aesthetics of a shoe. The bottom features a rubber grip that resembles the underside of a sneaker or boot. 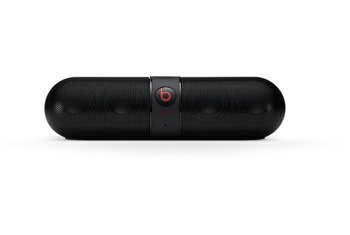 Not only does the bottom look cool, but also it helps absorb rattles and keeps the speaker from sliding. The carrying case, which comes with the speaker, protects against dust and splashes, so feel free to listen to it poolside. Users who want to plug in devices directly can take advantage of the 3.5 mm audio cable conveniently tucked into the sole. 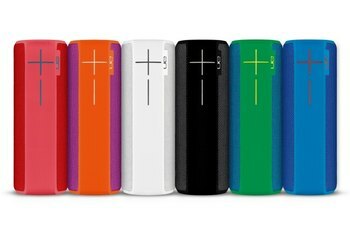 The speaker comes in a variety of color options, including black, yellow, blue, red, and gray. Pairing the Solemate with a variety of iOS devices and my Mac was seamless. The Solemate can remember up to eight separate devices. When you enter pairing mode, the Solemate declares, “Go ahead and connect me,” and then plays a jaunty jingle to celebrate the excitement of, you know, Bluetooth pairing. 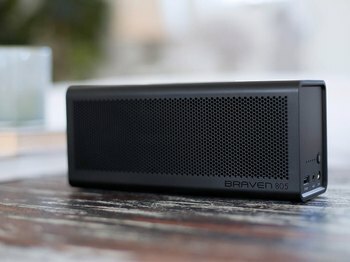 If you want to fill your room with sound, it's one of the best portable Bluetooth speakers we've heard, but if you want to take conference calls, you should try the Jambox or the Mini Boombox. 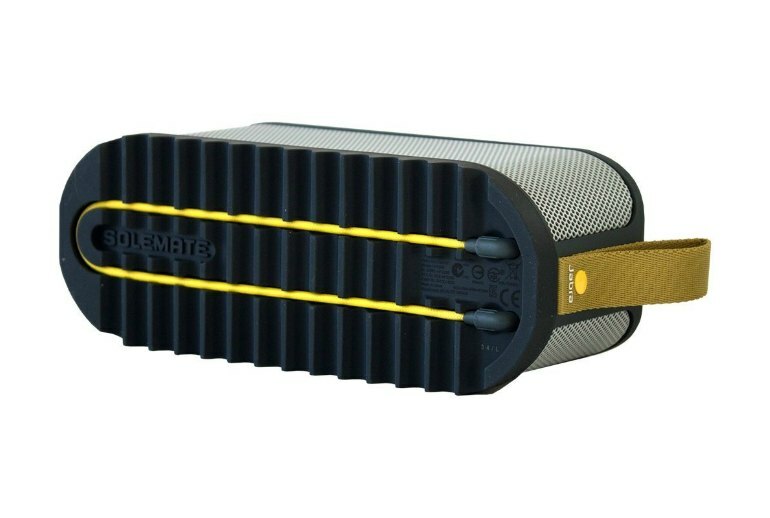 More rounded than the Jambox, the Solemate design is shoe-inspired with a fabric handle at the heel and a grooved bottom, which helps to stop the speaker from moving when you've got it at high volume. Underneath the audio jack you'll find a micro-USB port for power charging. 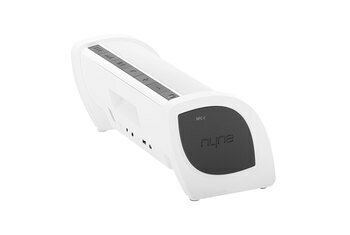 The device can be charged using the included wall charger, which would take about two-and-a-half hours, or by a PC with the included cable. One of the slicker features of the Solemate is the included "sound bag" accessory, which doubles as a splash-resistant cover and protective carrying case. 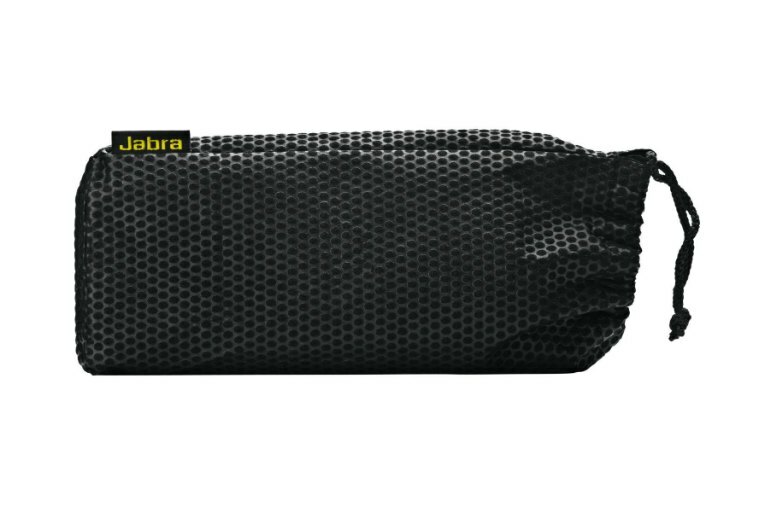 The bag's textured surface is designed to keep moisture, dirt, and sand out, but allows sound to escape virtually unimpeded. 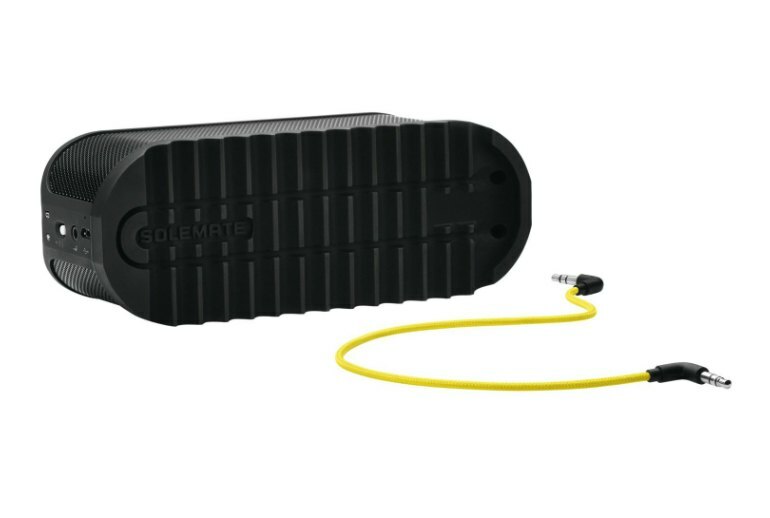 The Solemate is small and lightweight enough at 610g to carry around just about anywhere. It's not going to break anyone's back, but it's a little heavier than some of the competition out there due to dual tweeters and a woofer on the inside. Interestingly, the Solemate mainly relies on voice guidance to update you on its status, including battery life, connections and call status. Unfortunately, you can't control the voice guidance volume, so it is almost always too loud for an interior situation. 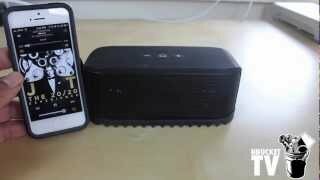 Jabra's Solemate Bluetooth speaker has a fun, kitschy design and it can pump out a fair amount of volume. 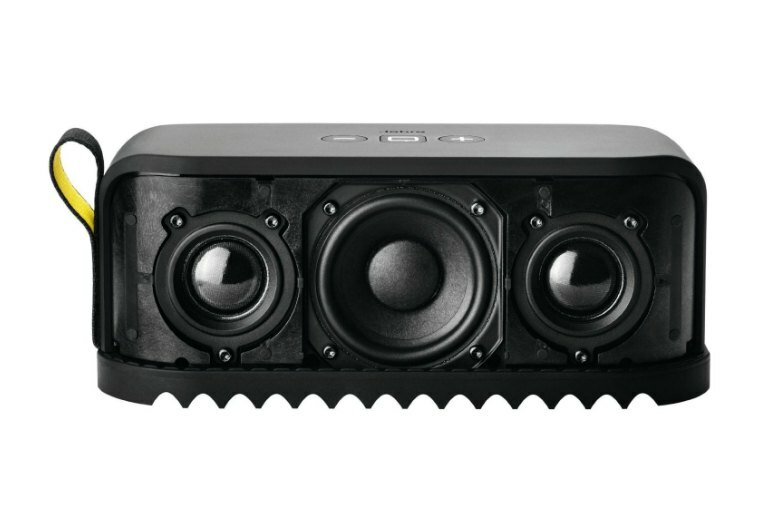 However, while this $199 speaker delivers passable sound for music that has light bass, tracks with deeper bass sounded distorted. 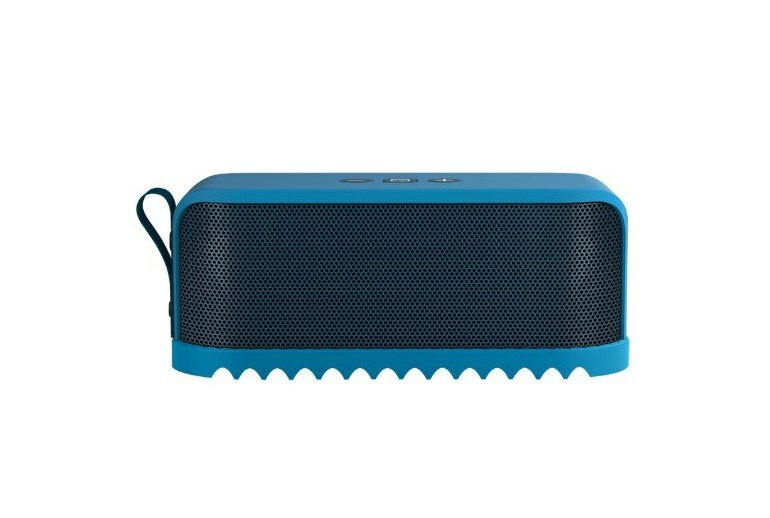 It's a small, solid little speaker with a hearty rubber sole that sits on the bottom, protecting the device from shocks and the like. The heel actually peels off, so you can replace it with different colors. 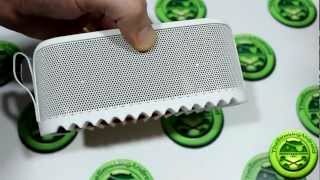 We wanted to love this speaker. It had plenty of fashion, but it left us with frustration.